Negotiation is an essential element of every person’s life, whether in the professional or personal arena. 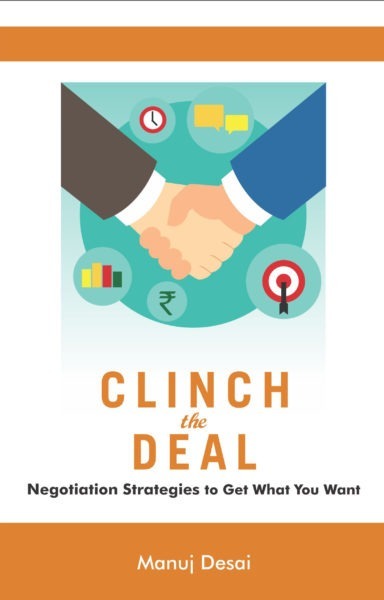 Clinch the Deal: Negotiation Strategies to Get What You Want focuses on understanding the agenda of the individuals involved, which, if done right, can help set the tone for a dialogue and ensure that you get what you want. 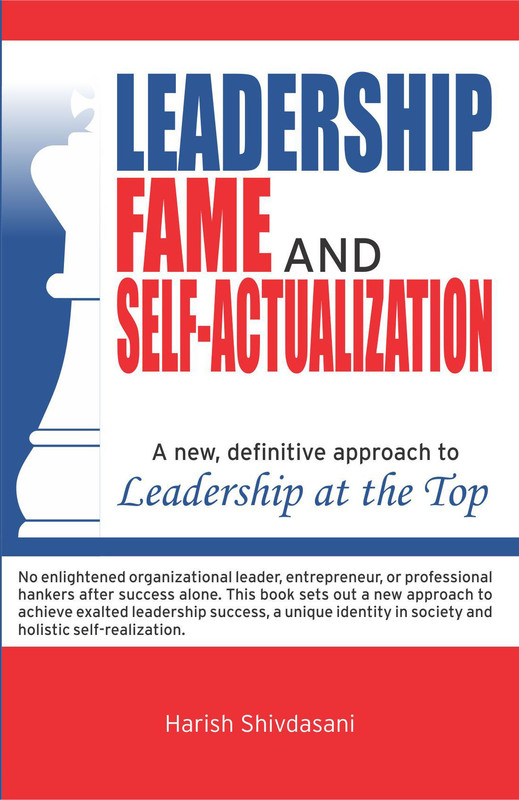 The book guides you through the techniques needed to tackle the “unknown” territories in a situation to achieve a successful outcome. You may send us payment via PayPal at indussource.digital@gmail.com for $ 15 ( Book Price $ 4 + $ 11 Shipping Charges ) and once the payment is confirmed we shall send the book via International Post services. It may take about 10 to 15 working days for the book to be delivered to your address. Kindly send us mail at order@indussource.com with your money transfer details and exact address for delivery and we shall keep you posted on the status of your order through e Mail. You may send us payment via PayPal at indussource.digital@gmail.com for $ 9 ( $4.00 for the Book & $5 for shipping ) and once the payment is confirmed we shall send the book via International Post services. It may take about 4 to 6 working days for the book to be delivered to your address. 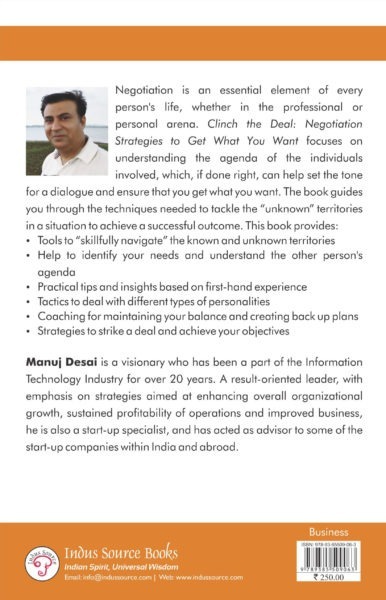 Manuj Desai is a visionary who has been a part of the Information Technology Industry for over 20+ years. 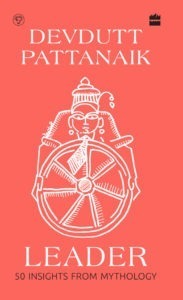 A result-oriented leader, with emphasis on strategies aimed at enhancing overall organizational growth, sustained profitability of operations and improved business performance for Multi-National Corporations, he is also a start-up specialist, and has acted as advisor to some of the start-up companies within India and abroad. We all negotiate from the time we are born- first through gestures and sounds and later learn through words and gestures. Yet, very few of us are trained to negotiate. Just as one can be an amateur cricketer or artist, most of us are amateur negotiators. To become professional in any field requires study and practice. “Clinch the Deal – Negotiation Strategies to Get What You Want” is a promising attempt to make professional negotiators out of us. There are innumerable books in the West on the subject- but this seems to be one of the few written and published in India. The book covers the subject well from Identifying Your Needs, Doing Your Homework to Your Walk Away Plan. It advocates well to prioritize our needs, as one cannot “boil the entire ocean in one go”. Understanding and assessing the other party is very important. The author puts it well, “Understanding “why” a person is doing something is more relevant than “what” he or she is doing. Another sane advice he offerd is to collect as much data as you can, connect the data, process the data and organise the data. He then goes on to describe importance of body language and micro-messages. This is what enables a negotiator to get the right human connection right. One point where one can disagree is when he says, “There is no win-win situation”. Yet, he clarifies when he talks about bargaining. If it a one-time interaction or deal, bargaining or Win-lose or Lose-win may work. However, for business and professional negotiations, where long-term relations are important, we must strive to achieve win-win. There are innumerable examples of successful win-win situations. A sound advice he renders is to understand people, be open-minded, have high energy level, gain the confidence of the other party and bring in a third person. He also emphasises, “Ask the right questions”. Another gem from him is ”Don’t get angry… but fake anger”. He goes on, “Have a back-up plan”, “More prepared you are, more you are likely to win” and “Have courage to walk-away”. A useful addition to Indian publications- the book by Manuj Desai is useful and practical.